having never quarreled with Him. For years I kept a copy of Thoreau's collected works by my bedside and spent a little time every night reading them whenever my mind was too busy to go to sleep but my body kept telling me it was time; it became a regular habit and I looked forward to my time together with Henry. I sat in his cabin on Walden Pond, canoed through the Concord and Merrimack Rivers, climbed Mount Ktaan, slept out under the stars, walked along the shores of Cape Cod, and carried canoes over portages with him. He became a wonderful friend over those years of nocturnal travels and it was a sad thing for me to come to the end of those journeys with Henry. Then I remembered the fifteen volumes of his Journals that were gathering dust on my library shelves and pulled out Volume 1 to continue my travels with him. The editor, Walter Harding, suggests that readers begin with Volume 2 because of the fragmentary nature of the first volume, "more apprentice work than the later volumes." And after all, "Why not start out with the best?" He also admonishes us, "It is a book not to leave on the library shelves but to live with. And it is inexhaustible." In this review I will share with you, dear Reader, my living with this volume. 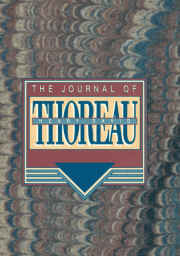 [page xli] Thoreau was a man of his own kind. Many things may be said of him, favorable and unfavorable, but this must surely be said first, — that, taken for all in all, he was like nobody else. On October 22, 1837, Ralph Waldo Emerson asked Thoreau, "What are you doing now? Do you keep a journal?" Henry notes Emerson's questions as his first entry in his Journal and adds: "So I make my first entry today." Thus he began his journal, with mere scraps of notes at first and by October 27, he wrote a complete story about his finding an arrowhead. Many people find arrowheads, but few ever found one the way Thoreau did - as the culmination of an imaginative story about Indians. [page 7] "There on the Nawshawtuct," said I, "was their lodge, the rendezvous of the tribe, and yonder, on Clamshell Hill, their feasting ground. . . . Here," I exclaimed, "stood Tahatawan; and there is Tahatawan's arrowhead." We instantly proceeded to sit down on the spot I had pointed to, and I, to carry out the joke, to lay bare an ordinary stone which my whim had selected, when lo! the first I laid my hands on, the grubbing stone that was to be, proved a most perfect arrowhead, as sharp as if just from the hands of the Indian fabricator!!!" The daily pieces average about a paragraph and occasionally comprise a simple sentence such as this one on August 4, 1838 titled Truth — "Whatever of past or present wisdom has published itself to the world, is palpable falsehood till it come and utter itself by my side." On April 24 this piece on Acquaintance appears - "Cheap persons will stand upon ceremony, because there is no other ground; but to the great of the earth we need no introduction, nor do they need any to us." On June 22, 1839, this one - "That virtue we appreciate is as much ours as another's. We see so much only as we possess." [page 93] Nov. 5, 1839 We are accustomed to say that the common sense of this age belonged to the seer of the last, — as if time gave him any advantage ground. But not so: I see not but Genius must ever take an equal start, and all the generations of men are virtually at a standstill for it to come and consider of them. Common sense is not so familiar with any truth but Genius will represent it in a strange light to it. Let the seer bring down his broad eye to the most stale and trivial fact, and he will make you believe it a new planet in the sky. Sometimes Thoreau's sayings are concise, but require a complete reading of the text preceding them for full understanding. For example, on page 107, he writes, "I am only introduced once again to myself." This refers to the process of friendship in which, in a friend, one meets oneself anew. Sometimes they are self-contained in their brevity as on Feb. 16, 1840 when he wrote, "Divination is prospective memory." That is an apt way of describing the process of "remembering the future" as I call it. It is a process that we all experience, but we have lacked the words for expressing the process, up until now. "Love at first sight" is an example of this process. What causes us to fall in love at first sight with someone or something is the summation of the feeling experiences washing over us from memories that we will create only in the future. [page 125] Feb. 29, 1840 A friend advises by his whole behavior, and never condescends to particulars; another chides away a fault, he loves it away. While he sees the other's error, he is silently conscious of it, and only the more loves truth himself, and assists his friend in loving it, till the fault is expelled and gently extinguished. [page 189] Jan. 31, 1841 For the herd of men multiplied many times will never come up to the value of one friend. [page 218] Feb. 19, 1841 In the love of narrow souls I make many short voyages, but in vain; I find no sea-room. But in great souls I sail before the wind without a watch, and never reach the shore. [page 221] Feb. 19, 1841 Would you know why I see thee so seldom, my friend? In solitude I have been making up a packet for thee. [page 223] Feb. 23, 1841 If my world is not sufficient without thee, my friend, I will wait till it is and then call thee. You shall come to a palace, not to an almshouse. [page 246] April 7, 1841 Friends are the ancient and honorable of the earth. [page 532] Dec. 25, 1840 Nature has many rhymes, but friendship is the most heroic of all. [page 534] Dec. 29, 1840 An echo makes me enunciate distinctly — So the sympathy of a friend gives plainness and point to my speech. This is the advantage of letter writing. Thoreau never strayed very far from his native Concord, never traveled abroad or out of New England. He was of the opinion that anything worth seeing could be seen in Concord if one looked long enough. [page 144] June 18, 1840 Of what consequence whether I stand on London bridge for the next century, or look into the depths of this bubbling spring which I have laid open with my hoe? He did not need foreign lands and sights for his work; he found his materials everywhere around him for his art. [page 149] June 23, 1840 He is the true artist whose life is his material; every stroke of the chisel must enter his own flesh and bone and not grate dully on marble. [page 153] June 26, 1840 The highest condition of art is artlessness. He will get to the goal first who stands stillest. There is one let better than any help, and that is, - Let-alone. By sufferance you may escape suffering. He who resists not at all will never surrender. Say, Not so, and you will outcircle the philosophers. Stand outside the wall, and no harm can reach you. The danger is that you be walled in with it. For an impenetrable shield, stand inside yourself. When one writes a poem, the poem is like a sacrament, it is but the outward sign of an inner grace. Thus only poets may fully comprehend this next thought of Thoreau's. [page 157] July 1, 1840 The true poem is not that which the public read. There is always a poem not printed on paper, coincident with the production of this, which is stereotyped in (RJM: parallel to) the poet's life, is what he has become through his work. Thoreau saw many a sunrise, noon, and sunset in his native Concord and in this next passage he emblazons the three phases of a day into a metaphor for one's life. [page 159] July 3, 1840 We will have a dawn, and noon, and serene sunset in ourselves. What we call the gross atmosphere of evening is the accumulated deed of the day, which absorbs the rays of beauty, and shows more richly than the naked promise of the dawn. By earnest toil in the heat of the noon, let us get ready a rich western blaze against the evening of our lives. We learn from him on July 5 that "You cannot rob a man of anything which he will miss." and we wonder what he means. This seeming heresy stumps us at first, and yet, as we ponder his words, we realize that to miss something is to call it forth into our presence, and thus we glean a subtle truth from his paradoxical words. One reads Thoreau quickly only at one's peril. On the very next day, July 6, he adds, as if to accentuate this point, "All this worldly wisdom was once the unamiable heresy of some wise man." There is a recurrent thread through Thoreau's journal about words, sentences, and the process of writing itself. Writing some 150 years ago, his usage of certain words and phrases sound strange to our ears. Take the use of the word "approve" with a direct object in the next passage. He means by "approves itself" that it sanctions or confirms itself. Contrast this passage to Emerson's epigram that "A word is a dead metaphor." In Thoreau's hands the dead metaphor is sculpted like granite into a work of timeless beauty and art. [page 172] July 27, 1840 A word is wiser than any man, than any series of words. In its present received sense it may be false, but in its inner sense by descent and analogy it approves itself. Language is the most perfect work of art in the world. The chisel of a thousand years retouches it. And if we are not gone we live there still. Thoreau says that "True verses are not counted on the poet's fingers, but on his heart-strings." and goes on to express this thought in a poem. But I could not both live and live to utter it. In these days of pot metal coins and plastic tumblers, one might need an interpreter to explain to those under fifty years old that coins once rang when they hit the counter because of the real silver contained in them. Likewise tumblers made out of leaded glass rang clear as a bell when one tapped them with one's finger. When one set a table, one typically rapped the tumbler and if it didn't ring, discarded the tumbler as defective, having a crack in the glass that would leak on an unsuspecting guest. [page 281] Sept. 2, 1841 When I write verses I serve my thoughts as I do tumblers; I rap them to see if they will ring. [page 345] Mar. 23, 1842 I am sure that I write the tougher truth for these calluses on my palms. They give firmness to the sentence. The sentences of the laboring man are like hardened tongs, or the sinews of the deer, or the roots of the pine. [page 350] March 26, 1842 A book should be a vein of gold ore, as the sentence is a diamond found in the sand, or a pearl fished out of the sea. [page 532] Dec. 25, 1840 The thought there is in a sentence is its solid part, which will wear to the latest times. In this next passage Thoreau speaks of what Dr. Galambos calls "primary property" — one's thoughts and ideas. [page 177] Jan. 26, 1841 A man's wealth is never entered in the registrar's office. Wealth does not come in along the great thoroughfares, it does not float on the Erie or Pennsylvania canal, but is imported by a solitary track without bustle or competition, from a brave industry to a quiet mind. He also waxes mathematical at times in his metaphors. "The best and bravest deed is that which the whole man — heart, lungs, hands, finger, and toes — at any time prompts. . . . This is the meaning of integrity; this is to be an integer, and not a fraction." It is said that "Rain falls on the just and the unjust." Its watery boon may come to all, but in water's frozen form, snow, its falling will appear very different according to the form upon which it falls - that make snow in Thoreau's hands a marvelous metaphor for the divine or spiritual world as it contacts each of us. [page 185] Jan. 30, 1841 The snow falls on no two trees alike, but the forms it assumes are as various as those of the twigs and leaves which receive it. They are, as it were, predetermined by the genius of the tree. So one divine spirit descends alike on all, but bears a peculiar fruit in each. The divinity subsides on all men, as the snowflakes settle on the fields and ledges and takes the form of the various clefts and surface on which it lodges. Thoreau tells us on page 189 that "It is easy to repeat, but hard to originate." That is as true in art as it is in life. Above a sea of repetitions stand the few mountains of originality or, as Thoreau says on the same page, "The stars are the mountain peaks of celestial countries." Light in the daguerreotype (photograph) is the amanuensis (secretary, transcriber) of nature, Thoreau continues, and the photograph must be taken in stillness, if but for an instant. "There is something analogous in the birth of all rhymes." In a series of passages on pages 208 and 209, Thoreau cautions that virtue and vice make a two-edged sword. "Every time we teach our virtue a new nobleness, we teach our vice a new cunning." Better it is to walk towards the sun as our shadows will always fall behind us. If we keep in the light, then neither fame nor infamy will hit us. Fame will go beyond us to the divinity that inspires us and infamy will "wallow where it was engendered." Thoreau had a clear antipathy for what is called charity, not for true charity. [page 212] Feb. 11, 1841 What is called charity is not charity, but the interference of a third person. Shall I interfere with fate? Shall I defraud man of the opportunities which God gave him, and so take away his life? . . . This almshouse charity is like putting new wine into old bottles, when so many tuns in God's cellars stand empty. We go about mending the times, when we should be building the eternity. One of my joys of a winter's evening is to stoke up a hearty fire that will warm my room to its very walls. It is no small trick to work up a fire that will not require one's constant attention, but will burn steadily while one is busy at one's chores. Thoreau builds up this simple process into a prescription for living. [page 218] Feb. 19, 1841 When I am going out for an evening I arrange the fire in my stove so that I do not fail to find a good one when I return, though it would have engaged my frequent attention present. So that, when I know I am to be at home, I sometimes make believe that I may go out, to save trouble. And this is the art of living, too, - to leave our life in a condition to go alone, and not to require a constant supervision. We will then sit down serenely to live, as by the side of a stove. [page 220] Feb. 22, 1841 We should make our notch every day on our characters, as Robinson Crusoe did on his stick. We must be at the helm at least once a day; we must feel the tiller-rope in our hands, and know that if we sail, we steer. We've all heard "beauty is in the eye of beholder" but is not prickliness also in the hand of the caresser? Thoreau thought so. [page 222] Feb. 26, 1841 My prickles or smoothness are as much a quality of your hand as of myself. I cannot tell you what I am, more than a ray of the summer's sun. What I am I am, and say it not. Being is the great explainer. In the attempt to explain, shall I plane away all the spines, till it is no thistle, but a cornstalk? And is not suspicion a subtle master? [page 246] April 7, 1841 You can tell what another's suspicions are by what you feel forced to become. You will wear a new character, like a strange habit, in their presence. Who has not felt the lightness of virtue or the heaviness of sin? The fall of humankind was a fall into materiality from the spirit world and with materiality comes gravity. [page 254] April 27, 1841Virtue is buoyant and elastic; but sin plods and shuffles. Newton needed not to wait for an apple to fall to discover the attraction of gravitation; it was implied in the fall of man. On August 9, 1841 he tells us that "It is vain to try to write unless you feel strong in the knees." My dad asked me once if writing was difficult. I answered him this way, "Writing is easy; it's having something worth writing about that's difficult." I might have added that one can't write unless "one feels strong in the knees" - that is, one must have a strong "I" - the "I" rightly understood is that part of us, our individuality, that allows us to rise erect upon strong knees, something no animal can do for long, but humans do daily. To be strong in the knees is to write from one's "I" and that is no task that can be taught in a creative writing course, it can be learned only in the course of life. And when someone writes a book that speaks clearly out of their creative "I", it grabs us with a force that is irresistible. I experienced what Thoreau speaks of below when I finished reading Chaos, Science and Sanity, Laws of Form, and The Philosophy of Freedom. [page 268] Aug. 9, 1841 Any book of great authority and genius seems to our imagination to permeate and pervade all space. Its spirit, like a more subtle ether, sweeps along with the prevailing winds of the country. Its influence conveys a new gloss to the meadows and the depths of the wood, and bathes the huckleberries on the hills, as sometimes a new influence in the sky washes in waves over the fields and seems to break on some invisible beach in the air. All things confirm it. It spends the mornings and the evenings. In the following passage one could read the forenoon and afternoon as referring to the youth and old age of one's life. If we look only to the future, we must look to the sunny side of things in the morning and the shadowy side in the afternoon. But the Sun revolves around the Earth and morning comes again. Today we experience the results of plans we laid out for ourselves on previous days. If we look back to those previous days of planning we may find the sunny side even in the afternoons of our lives. [page 273] Aug. 18, 1841 Perhaps the forenoon is brighter than the afternoon, not only because of the greater transparency of the atmosphere then, but because we naturally look most into the west, -- as we look forward into the day, — and so in the forenoon see the sunny side of things, but in the afternoon the shadow of every tree. If one thing distinguishes true art from kitsch, it is that true art is rough, it has sharp edges, it is unexpected, it is — well — ugly is the usual word applied to it by those who come with expectations of well executed sameness rather than a unique product of a human's life. Thoreau, a true artist, recognizes that process and expresses it with amazing alacrity. [page 275] Aug 28, 1841 The art which only gilds the surface and demands merely a superficial polish, without reaching to the core, is but varnish and filigree. But the work of genius is rough-hewn from the first, because it anticipates the lapse of time and has an ingrained polish, which still appears when fragments are broken off, an essential quality of its substance. Its beauty is its strength. It breaks with a lustre, and splits in cubes and diamonds. Like the diamond, it has only to be cut to be polished, and its surface is a window to its interior splendors. In this next passage we can hear the inner prompting that led Thoreau to go to live in the cabin by Walden Pond. [page 299] Dec. 24, 1841 I want to go soon and live away by the pond, where I shall hear only the wind whispering among the reeds. It will be success if I shall have left myself behind. But my friends ask what I will do when I get there. Will it not be employment enough to watch the progress of the seasons? [page 301] Dec. 25, 1841 All true greatness runs as level a course, and is as unaspiring, as the plow in the furrow. [page 313] Jan. 5, 1842 I want to see a sentence run clear through to the end, as deep and fertile as a well-drawn furrow which shows that the plow was pressed down to the beam. . . . A well-built sentence, in the rapidity and force with which it works, may be compared to a modern cornplanter, which furrows out, drops the seed, and covers it up at one movement. In the first year of the new millennium we are confronted by war on a scale not experienced for many years. It would do well for us to reflect on what Thoreau has to say about war and law and how the two relate to each other. [page 334] March 16, 1842 In war, in some sense, lies the very genius of law. It is law creative and active; it is the first principle of the law. What is human warfare but just this, — an effort to make the laws of God and nature take sides with one party. Men make an arbitrary code, and, because it is not right, they try to make it prevail by might. The moral law does not want any champion. Its asserters do not go to war. It was never infringed with impunity. It is inconsistent to decry war and maintain law, for if there were no need of war there would be no need of law. What is the moral law that Thoreau speaks of? I'd like to think of it as our moral nature instead of a moral law, a moral nature that bridges many lifetimes of each individual and allows each of us to come out all right in the process. He says it this way on page 339, "Man's moral nature is a riddle which only eternity can solve." This next thought requires some work. James Barrie, author of Peter Pan, once wrote, "God gave us memory so that we might have roses in December." Obviously he wrote this before greenhouses growing fresh roses during the winter were common so no roses were available in winter. Thoreau likens present joy to the nectar of flowers and memory to the honey of bees. [page 358] April 3, 1842 The weight of present woe will express the sweetness of past experience. When sorrow comes, how easy it is to remember pleasure! When, in winter, the bees cannot make new honey, they consume the old. Is it not fitting that our senior citizens are called Golden Agers since they consume the golden honey of memories that they stored up in their youth? For someone who wrote so much, Thoreau was a man of few words, that is, he loved brevity and extolled it whenever he found it. [page 519] Nov. 4, 1840 By your few words show how insufficient would be many words. If after conversation I would reinstate my thought in its primary dignity and authority, I have recourse again to my first simple and concise statement. 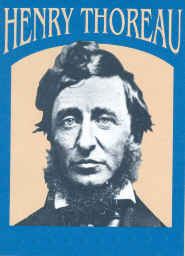 This is the author whose words I read each night; I take deep draughts of the potion Thoreau pours out in the pages of his books and in that potion I find a sweet repose. I recommend the same to you, dear Reader. [page 307] Dec. 31, 1841 I should like to keep some book of natural history always by me as a sort of elixir, the reading of which would restore the tone of my system and secure me true and cheerful views of life.